One of the best things about moving to New Zealand is going to be exploring your new country. Both islands offer unique slices of natural beauty that change from town to town, but never fail to take your breath away. Plus, when you’re all the way on the other side of the world – staycations might be the way to go! If you are keen to buy a New Zealand holiday home, this article is for you. Today we’re looking at 10 of the best spots to snap up a New Zealand holiday home and revealing what type of property you can get for your money. Consider Lake Tekapo for your New Zealand holiday home if you fancy living on the shore of one of the world’s most beautiful lakes, against a backdrop of snow-peaked mountains. This other-worldly lake shines an eerie milky blue, caused by glacial sediment. During summer, you’ll be able to enjoy hikes around the lake and up into the mountains, amongst the native wildflowers. And come winter, there are two ski fields to carve up close by. Also, you can ice skate on the lake and then relax in some highly scenic hot pools. Furthermore, Lake Tekapo is the perfect place for stargazers – the area is part of the world’s largest Dark Sky Reserve, which means you can enjoy incredible views of the night sky (preferably from said hot pools). Annual hours of sunshine: 2,402. Holiday home prices: Prices for a cabin on the lake start at NZ$600,000, but million-dollar properties are becoming increasingly common. Getting here: Three hours (scenic) drive from either Christchurch and Queenstown. 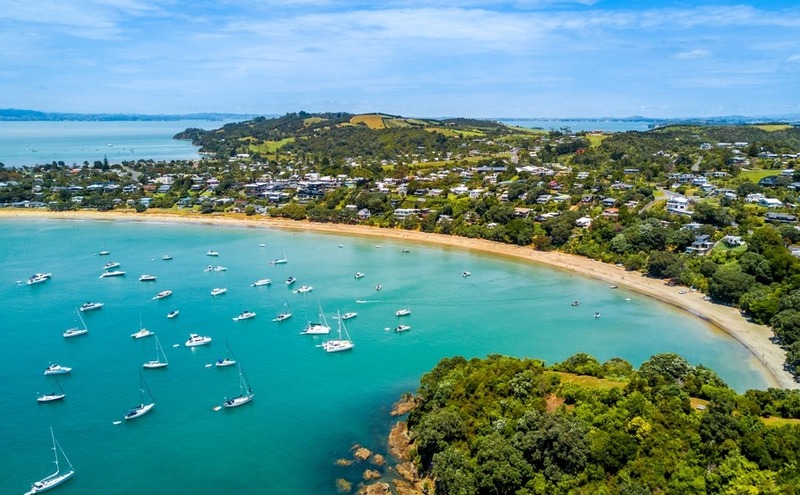 Buying a New Zealand holiday home in a location like Waiheke will allow you to wake up every morning to wonderful weather and beautiful natural scenery. While the magic of Waiheke Island is just 30 minutes from Auckland CBD, when you arrive, mark our words, you’re going to feel like you’re in Hawaii. We’re talking palm trees, rolling tree-covered hills and white sandy beaches. All this, plus excellent wineries! Buying a New Zealand holiday home on Waiheke Island will provide you with a getaway from the Big Smoke and a place to entertain friends over fantastic wine. Also, the island boasts an arty community, lots of lovely restaurants, and forests and olive groves to explore if you enjoy a good hike. Annual hours of sunshine: 2,008. Holiday home prices: It’s possible to find a modest one or two bed property from around $750,000, but if you want lots of space and a view to die for, expect to pay more in the region of $1,100,000. Getting here: 30-minute ferry from Auckland CBD. Mount Maunganui often tops lists of ‘New Zealand’s Best Beaches’, so if you’re a beach bunny, a New Zealand holiday home here could be just the ticket. The town itself is a fun place to be. It’s not only a friendly and scenic spot, but there are lots of great cafes and restaurants to hang out in if you don’t fancy firing up the BBQ. Mount Maunganui often tops lists of ‘New Zealand’s Best Beaches’, so if you’re a beach bunny, a New Zealand holiday home here could be just the ticket. “The Mount” as the locals call it, is located on the peninsula at the end of Tauranga Harbour. This peninsula is a sandbank – on one side you can enjoy a relaxed dip in a sheltered harbour. On the other, you can go for a surf. If you’re in the market for something more active than just lounging in the sunshine, there are a range of hikes for all abilities which lead you to the summit of Mauao – the mountain perched at the end of the peninsula. Annual hours of sunshine: 2,346. Holiday home prices: You can buy yourself a lovely little beach house from $620,000. Getting here: Four-hour drive from Auckland, or you can fly into Tauranga Airport. If you’re flying internationally, you can fly to Rotorua, which is 30 miles away. 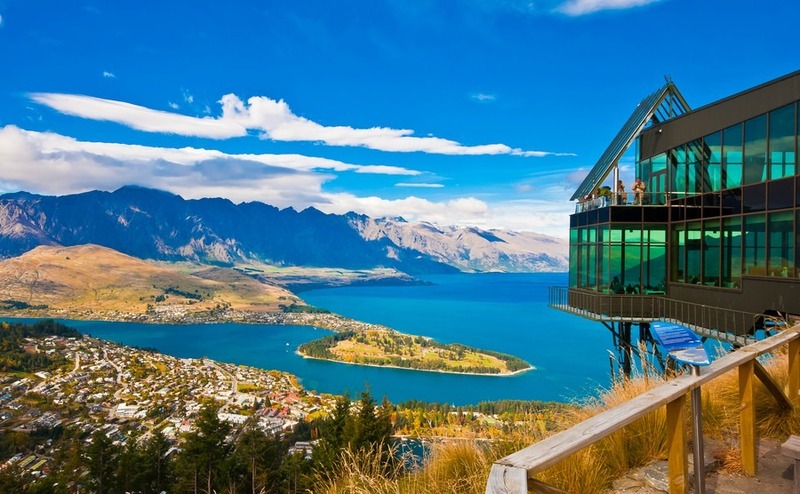 Queenstown’s breathtaking scenery makes it a popular place for a New Zealand holiday home. We can’t compile a list of the best places to buy a New Zealand holiday home without mentioning Queenstown. This spectacularly beautiful location is just the kind of spot you’re going to want to return to year after year. As well as being located on the shores of the crystal-clear Lake Wakatipu, you will enjoy views of The Remarkables. This is the name of the unbelievable mountain range towering over the charming town, where you can also ski. This is just the spot for any adrenaline junkies. You can bungy jump, sky dive, mountain bike, hop on a jet boat, or simply enjoy a good hike. The town itself is popular with tourists. Therefore, if you want to rent out your New Zealand holiday home while not around, you won’t struggle to find tenants. Annual hours of sunshine: 1,930 hours of sunshine, and 3.7 metres of snow. Holiday home prices: Centrally-located apartments start from $600,000. If you’re looking for something larger with lake or mountain views, head a short distance out of town and you can find three and four bed houses starting from $850,000. Getting here: Queenstown International Airport is just 8km from town. You can catch domestic flights from Auckland (1hr 50m), Wellington (1hr 20m) or Christchurch (55m). 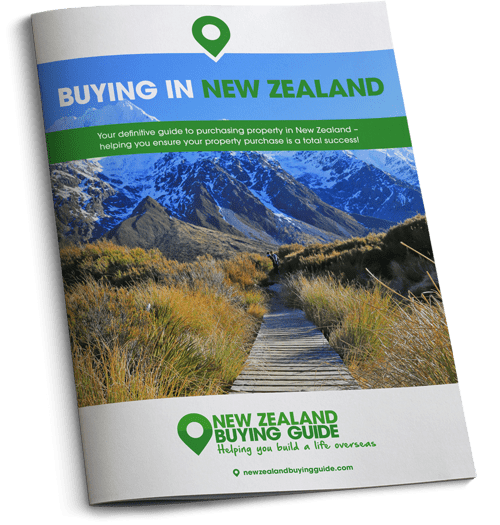 Learn how to get the most out of your estate agent when buying a New Zealand holiday home with our guide, How to Negotiate Abroad. Fancy your own private haven on the Coromandel Peninsula? Us too! Whitianga is a great, affordable place for a base in this scenic spot located to the east of Auckland. This is a typical laid-back beach town with lots of friendly locals. Most importantly, it’s within easy reach of some of the peninsula’s main attractions: Hot Water Beach, Cooks Beach, Hahei and Cathedral Cove. Annual hours of sunshine: 2,140. Holiday home prices: A three-bedroom, modern apartment close to the beach costs $499,000. For something slightly swankier with ocean views, expect to pay in the region of $860,000. Getting here: Two-hour ferry ride from Auckland, or a two-and-a-half-hour drive. If you dream of spending your holidays exploring the country’s coral reefs, Paihia could be the New Zealand holiday home destination for you. This is one of New Zealand’s premier dive spots. Paihia is a great base for enjoying all that the glorious Bay of Islands has to offer. It’s got a buzzing town centre with plenty of bars and restaurants. Furthermore, you can hike to some seriously scenic spots, including Haruru Falls, and the Opua Forest Paihia Lookout Track. For those dreaming of spending their holidays exploring the country’s coral reefs, Paihia is one of New Zealand’s premier dive spots. Annual hours of sunshine: 2140. Holiday home prices: A five-bedroom house with ocean views comes from as little as $565,000. Getting here: Three-hour drive from Auckland. This sleepy beach village is a peaceful spot…until summer arrives, and then the population can sometimes quadruple overnight! Located in Golden Bay, it’s a relaxing place to be. Plus, this is the closest you’ll get to the northern entrance to Abel Tasman National Park. When visiting your New Zealand holiday home in Pohara, you can visit Ngarua Caves and Harwoods Hole – a great spot for hiking and (if the nerves allow it) caving. Additionally, you’ll be able to enjoy the delights of the sacred Pupu Springs and Wharariki Beach – where wind and wave power have created some remarkable rock formations. Also, Farewell Spit is a lovely spot you’ll want to explore. You can investigate this bird sanctuary on foot or via four-wheel drive. Holiday home prices: For a three-bed property with panoramic views of Golden Bay, expect to pay around $880,000. Getting here: You can catch a ferry from Wellington to Picton in three hours and then the drive will take you two further hours. Christchurch is the international gateway to Pohara, but the drive will take you seven hours. Raglan is a lively but laidback beach town, famous for its waves, its black sand beaches and for its locals saying ‘NO’ to all major chains. Spend your holidays surfing the world’s most consistent break (whatever that means) or enjoying a more relaxing dip in the sea over at Ocean Beach. You can paddleboard, kiteboard…basically anything with a board! Plus, there is lots of bush to explore around the town. Annual hours of sunshine: 2,200. Holiday home prices: For a simple two-bed townhouse close to the beach, expect to pay around $500,000. For something larger right on the water, you’re looking at a starting price of $900,000. Getting here: Two-hour drive from Auckland. Make sure you’re up to date with accessing healthcare in New Zealand by exploring our new guide, Healthcare Abroad 2018. Where better to base yourself every holiday than as close as possible to Milford Sound? Located near to the spectacular Fiordland National Park, you’ll be able to enjoy as much time as you wish exploring one of New Zealand’s most impressive landscapes. Te Anau is a lakeside town around two hours’ drive from the park and has a lot to offer those searching for a New Zealand holiday home. The Te Anau Caves are home to underground waterfalls and millions of glow worms. You’re also close to Kepler Track, one of the country’s best hikes, which takes in glacial valleys, mountains and thick beech forests. You can enjoy scenic flights over the region, fishing, kayaking and lake cruises. After a long day of exploration, dine in any of the town’s many restaurants, where they serve up delicious, hearty fare like venison, steak and lobster. Annual hours of sunshine: 1,640. Holiday home prices: You can buy a three-bedroom property with wonderful views for $455,000 (£236,000). Getting here: Two-hour drive from Queenstown. 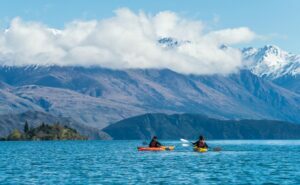 Wanaka’s mountains and lakes mean there are plenty of activities to enjoy if you buy a holiday home in the region. Another completely stunning spot for those enticed by wonderful views is Wanaka, located in the South Island’s Alps. Each time you return to your New Zealand holiday home, enjoy the natural calm of lakes and mountains while also delighting in the area’s galleries, shops, restaurants and cafés. Lake Wanaka covers 193m2, making it perfect for boating, kayaking and sailing. Also, during summer, you can go fishing, rock climbing, canyoning and more. When winter arrives, ski and snowboard at Treble Cone and Cardrona. Additionally, there’s opportunity to cross-country ski, or even heli-ski in the Harris Mountains, if you’re feeling brave. Wanaka is also close to Cromwell, Alexandra and Queenstown, affording you lots of variety every time you go on holiday. Annual hours of sunshine: 2,100. 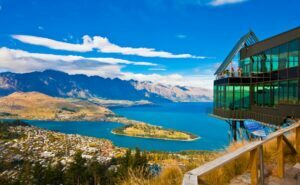 Holiday home prices: You can buy a modern three-bed apartment for $565,000, or for an elevated plot overlooking Lake Wanaka, expect to pay $1,000,000. Getting here: One-hour drive from Queenstown. With many areas of New Zealand becoming more affordable, and the southern hemisphere’s spring only a few months away, now is the perfect time to get started with buying a New Zealand holiday home. Who knows, your next Christmas could be spent relaxing in the sun on the beach!